Reviews of DVD releases of Classic Series Doctor Who, from the series' initial run in 1963 - 1989. Discussion of story, production, DVD extras and more! Come join the discussion AND the fun! It's Microphones and Maracas as David, Marty and Josh Zimon sit down and chat with some of the celebrity guests at this year's L.I. Who convention. Sit back and enjoy casual chats with Dan Starkey, Paul McGann, Ian McNiece and the one and only Carol Ann Ford! Then...throw "casual" out the window as the guys sit down with the human tornado that is Katy Manning! What better way to celebrate the 100th episode of Hoo On Who than to sit down with Wendy Padbury and Frazer Hines to reminisce about the Seed of Death! David and Marty discuss their trip to L.I. Who 3, celebrities meetings, DVD Extras, Listener Feedback Email, and THEN...THEN...Dear Listeners, there is MORE! Yes! Joining us is Matthew Jacobs, writer and co-producer of the 1996 TV Movie and Vanessa Yuille, who are producing a new Doctor Who documentary about American Doctor Who fans and THEY NEED OUR HELP!! Please check out their Indie Go Go site and the intro video at the link below and become a part of something really special! Welcome to a Promise Keeping Edition of Hoo on Who! This month the guys find themselves on answering a distress call on one of the moons of Saturn. Once they arrive the staff have all grown out their eyebrows and tried desperately hard to maintain eye contact. Later full clothed clones of our heroes get shrunk down and injected into David's brain to fight a giant shrimp! And Marty's allergic! So join us the month as we discuss the Tom Baker episode The Invisible Enemy! Also we will discuss The Magician's Apprentice and the Witch's Familiar! We also discuss DVD extras, read listener feedback, and generally carry on about things. C. Wash a Silurian Costume on "HOT"
D. All of the Above!! The guys travel to England in 1666 in a misguided attempt to join Peter Davison and Co. as they come face to face with the Great Plague, An Android disguised as Death, Teraleptils, and the Great Fire of London! Join us as we discuss DVD Extras, Marty's review of Big Finish, read listener feedback email, and say farewell to the Sonic Screwdriver! This month the guys find themselves in a legitimate stone quarry right before detonation. They find a stone hand and a ring that begins to regrow when exposed to radiation. Marty wears some silly overalls and some bloake named Elrdrad keeps going on about him living. We also discuss the last in a series of main range Big Finish stories featuring the 5th Doctor, Peter Davison, Maureen O'Brien, and Peter Pervus. Marty continues his Big Finish series on the Tom Baker adventures as well. We round out the Big Finish parade this episode by talking about an older release that is the sequel to Hand of Fear, Eldrad Must Die, featuring Peter Davison, Janet Fielding, Sarah Sutton, and Mark Strickson. We also read listener feedback, and jabber on about various things. Don't miss this exciting and jam packed episode of Hoo on Who! Eldrad Must LIVE! David talks with Andre Tessier from Long Island Doctor Who about some exciting guest announcements for this November's con! Tickets are still available! Come join us! David and Marty land in the quaint town of Perivale to check out where Ace called home, only to discover more cats than even these two are used to seeing! Soon the guys find themselves embroiled in a battle for their lives against sweaty dancers, stunt casted shopkeepers and the Master himself!! Andre Tessier returns to update us on the goings on in Long Island as the prep for L.I. Who 3 continues! David reviews Big Finish's 'The Last Cyberman', the guys discuss DVD extras and split the rather light Listener Feedback email load evenly in this fur filled edition of Hoo On Who! Enjoy! Omega has control of the Matrix and Marty has control of the TARDIS as the guys head to Amsterdam for the Peter Davison story, Arc of Infinity! Marty reviews the latest Tom Baker Big Finish adventure, the guys discuss DVD extras, British stunt casting and read some fantastic listener feedback emails! David and Marty decide to head to the Psychic Circus after receiving a Spambot advertising free popcorn (Marty can't resist free popcorn). In this episode, the guys review The Greatest Show in the Galaxy, discuss a few non-Doctor Who things, DVD Extras, Marty's engagement and read Listener Feedback Email. David joins Marty's Big Finish obsession as both Hooies review separate BF audio adventures, one featuring Tom Baker's Doctor and the other Sylvester McCoy! David and Marty find themselves on a cargo freighter in the middle of a skirmish between Earth and the Draconians in the 25th century while Marty attempts to explain to his Dad what a Laan is while covering the latest Big Finish Adventure for Tom Baker's Doctor, the guys apply some Venusian Akido to the Listener Feedback email bag, discuss muffin smuggling and are joined again by Andre Tessier for an update on L.I. Geek and L.I. Who 3! Enjoy! Bundle up! David and Marty are headed to the Arctic to discuss the Tom Baker story, The Seeds of Doom. David chats with Andre Tessier of Long Island Doctor Who in a new segment discussing Con updates, L.I. Geek, his thoughts on the recent Gallifrey One convention and 2 special guest announcements for L.I. Who 3! The guys cover DVD Extras, read listener feedback emails and Marty throws fate to the wind yet again with the Randomizer to see what is in store next month! David, Marty and Ian sit down to discuss the 2014 Doctor Who Christmas special, ‘Last Christmas’. Opinions ran the gamut and Marty broke the censor bleep button at one point! A good time was had by all, recounting the 2014 Hooie Christmas and speculating on Series 9. David, Marty and Ian sit down to discuss the 2014 Doctor Who Christmas special, 'Last Christmas'. Opinions ran the gamut and Marty broke the censor bleep button at one point! A good time was had by all, recounting the 2014 Hooie Christmas and speculating on Series 9. David and Marty review the first Tom Baker story, Robot. The guys cover DVD Extras and read listener feedback email featuring the first Guest announcement for L.I. Who 3 in 2015! Stay tuned for the Christmas Special review in a few days! David and Marty review the Third Doctor story, The Mutants in a delayed and brief edition of Hoo On Who. Marty finishes his High Speed Review of New Who with the final 3 series 8 episodes. As an extra added Christmas bonus, Marty reviews a Big Finish story, Weapon of Choice. The guys cover DVD Extras as well as reading a short selection of Listener Feedback email. It is the much anticipated LI Who 2 episode of Hoo On Who, where David forces his friend and fellow podcaster, Josh Zimon, into the Burt Ward sidecar to interview Doctor Who illuminaries like: Paul McGann, Colin Baker, Wendy Padbury, Deborah Watling, Nicola Bryant, and the legendary Terrance Dicks! If your heart can handle all of that, then stick around and listen to David’s solo interviews with writer Nev Fountain and LI Who show runner, Ken Deep! Mucho thanks to Marty for stepping up and helping get this produced and out! It is the much anticipated LI Who 2 episode of Hoo On Who, where David forces his friend and fellow podcaster, Josh Zimon, into the Burt Ward sidecar to interview Doctor Who illuminaries like: Paul McGann, Colin Baker, Wendy Padbury, Deborah Watling, Nicola Bryant, and the legendary Terrance Dicks! If your heart can handle all of that, then stick around and listen to David's solo interviews with writer Nev Fountain and LI Who show runner, Ken Deep! Mucho thanks to Marty for stepping up and helping get this produced and out! It’s a full sized episode of Hoo On Who! David and Marty travel back to England in 1215 to review the Peter Davison story, The King’s Demons. The guys discuss DVD Extras and respond to listener feedback. Also, Marty continues his High Speed Reviews of New Who series 8 with reviews of Kill The Moon, Mummy on the Orient Express, and Flatline. David chat with Dave Marsh of GoPop.TV about their new commentary app. Finally, at long last, Dr. Phill is back to review The King’s Demons as only he can! It's a full sized episode of Hoo On Who! David and Marty travel back to England in 1215 to review the Peter Davison story, The King's Demons. The guys discuss DVD Extras and respond to listener feedback. Also, Marty continues his High Speed Reviews of New Who series 8 with reviews of Kill The Moon, Mummy on the Orient Express, and Flatline. David chat with Dave Marsh of GoPop.TV about their new commentary app. Finally, at long last, Dr. Phill is back to review The King's Demons as only he can! A TARDIS malfunction lands David and Marty in there intended destination (Rome 64 AD) but it’s a trip the guys won’t soon forget! Join the Hooies as they discuss the First Doctor story, The Romans, talk DVD Extras and engage with listener feedback email, including audio feedback from our pal Theta Sigma! Marty also does High Speed Reviews of New Who for episodes 2 - 5 of Series 8! Enjoy! A TARDIS malfunction lands David and Marty in there intended destination (Rome 64 AD) but it's a trip the guys won't soon forget! Join the Hooies as they discuss the First Doctor story, The Romans, talk DVD Extras and engage with listener feedback email, including audio feedback from our pal Theta Sigma! Marty also does High Speed Reviews of New Who for episodes 2 - 5 of Series 8! Enjoy! David and Marty are off to the planet Peladon to look in on some mysterious curse. But first, after a very LONG wait, the High Speed Review of New Who is back with a quick discussion of Deep Breath and all things Peter Capaldi! The guys cover DVD Extras (okay Marty does because David didn’t watch them) and read listener feedback email from new listeners, returning listeners and MARK NUTTALL!! David and Marty are off to the planet Peladon to look in on some mysterious curse. But first, after a very LONG wait, the High Speed Review of New Who is back with a quick discussion of Deep Breath and all things Peter Capaldi! The guys cover DVD Extras (okay Marty does because David didn't watch them) and read listener feedback email from new listeners, returning listeners and MARK NUTTALL!! The Hooie boys are joined by Josh Zimon from ‘Mostly Harmless Cutaway and The Memory Cheats’ to discuss Doctor Who news and review the Tom Baker story, The Horns of Nimon. They guys chat about the story, the direction of the show under Script Editor, Douglas Adams and how uncomfortable it is for David to hear anyone other than John Leeson voice K9. All 3 go over the DVD extras and comment on a small collection of Listener Feedback emails. The Hooie boys are joined by Josh Zimon from 'Mostly Harmless Cutaway and The Memory Cheats' to discuss Doctor Who news and review the Tom Baker story, The Horns of Nimon. They guys chat about the story, the direction of the show under Script Editor, Douglas Adams and how uncomfortable it is for David to hear anyone other than John Leeson voice K9. All 3 go over the DVD extras and comment on a small collection of Listener Feedback emails. 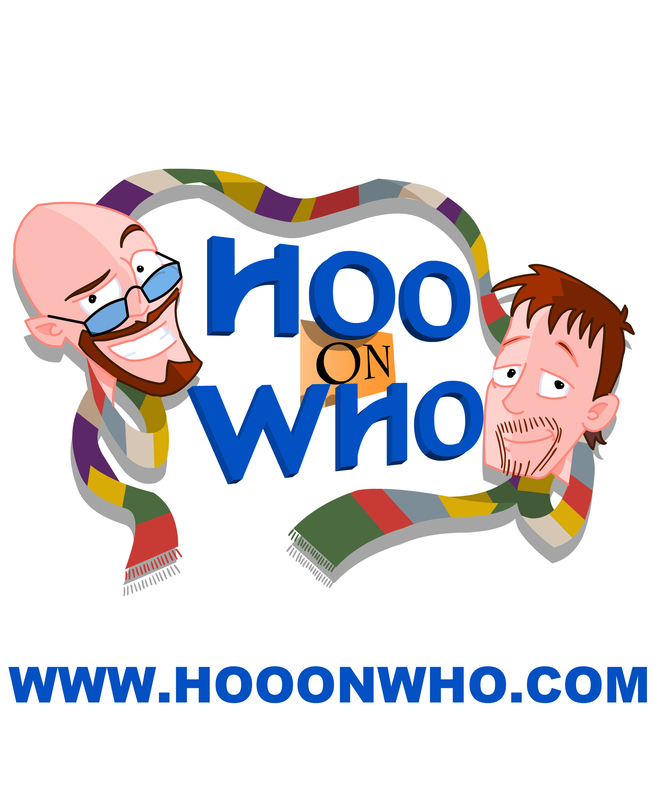 It is an extra special June Edition of Hoo On Who where David and Marty discuss some new Doctor Who news, Long Island Doctor Who announcements, Steven Moffat trolling the fans, and the lack of Doctor Who coverage at SDCC. The guys reminisce about the maiden voyage of their TARDIS at Knoxville’s Fanboy Expo and play some interview clips with Doctor Who fans at the event. We then plunge into the nest of vipers that is Snakedance to talk about a surprisingly enjoyable story and some wonderful DVD extras. The mailbag was noticeably light this month, but just WAIT until you see what is coming up in July!! It is an extra special June Edition of Hoo On Who where David and Marty discuss some new Doctor Who news, Long Island Doctor Who announcements, Steven Moffat trolling the fans, and the lack of Doctor Who coverage at SDCC. The guys reminisce about the maiden voyage of their TARDIS at Knoxville's Fanboy Expo and play some interview clips with Doctor Who fans at the event. We then plunge into the nest of vipers that is Snakedance to talk about a surprisingly enjoyable story and some wonderful DVD extras. The mailbag was noticeably light this month, but just WAIT until you see what is coming up in July!! In this short but sweet episode of Hoo On Who, the Hooie men sit down to discuss The Chase. Ian and Barbara’s last adventure with William Hartnell’s Doctor. David and Marty talk about the story at length, cover DVD extras and read listener feedback emails. The guys also share exciting guest announcements for this November’s L.I. Who and plug their upcoming appearance at Knoxville’s Fanboy Expo this coming weekend! In this short but sweet episode of Hoo On Who, the Hooie men sit down to discuss The Chase. Ian and Barbara's last adventure with William Hartnell's Doctor. David and Marty talk about the story at length, cover DVD extras and read listener feedback emails. The guys also share exciting guest announcements for this November's L.I. Who and plug their upcoming appearance at Knoxville's Fanboy Expo this coming weekend! David and Marty enjoy a nice afternoon Cricket match in 1925 England and discuss DVD Extras, Doctor Who conventions and read listener feedback emails. In a Dinosaur sized episode, the Hooies meet up with friend and fellow podcaster, Luke Harrison, to tear through a deserted Central London with Jon Pertwee, Elisabeth Sladen and the boys from U.N.I.T. It’s Invasion of the Dinosaurs!! The guys discuss dodgy special effects, plot holes, Luke’s father and his budding composing career, as well as DVD extras, and enough Listener Feedback email to choke….well, a dinosaur!! In a Dinosaur sized episode, the Hooies meet up with friend and fellow podcaster, Luke Harrison, to tear through a deserted Central London with Jon Pertwee, Elisabeth Sladen and the boys from U.N.I.T. It's Invasion of the Dinosaurs!! The guys discuss dodgy special effects, plot holes, Luke's father and his budding composing career, as well as DVD extras, and enough Listener Feedback email to choke....well, a dinosaur!! David and Marty decide to vacation at Paradise Towers where they discuss Kangs, social decay and DVD extras! It’s a down and dirty episode of Hoo On Who this month with some great listener feedback to give us a boost! David and Marty decide to vacation at Paradise Towers where they discuss Kangs, social decay and DVD extras! It's a down and dirty episode of Hoo On Who this month with some great listener feedback to give us a boost! David and Marty discuss Christmas at the Hooie house, the Hobbit, David’s uncomfortable sentient Xbox One and other topics, including their thoughts on Matt Smith’s swan song as the Doctor in The Time of the Doctor. David and Marty discuss Christmas at the Hooie house, the Hobbit, David's uncomfortable sentient Xbox One and other topics, including their thoughts on Matt Smith's swan song as the Doctor in The Time of the Doctor. It is our Post-Chicago TARDIS show! David and Marty discuss the convention, meeting up with listeners and friends. Interviews galore as the guys chat with Peter Davison, Ed Stradling, Dan Hall, Louise Jameson and Colin Baker! Marty does a high speed review of the last episode of Destiny of the Doctor as well! Pack a lunch! This one is almost 2 hours long!